The revelry of summer parties isn't far off – and it's often the highlight of the year, in part because of the incidents you're pretty much guaranteed to see and hear as the day progresses...and devolves. Make the most of the typical scenes with our Summer Party Bingo Game. It works like normal bingo, of course, except that you get to creepily people-watch, all in the name of sport. Every time you see or hear one of the following summer party staples, cross it off. When you've crossed off an entire row – horizontal, vertical or diagonal – you've won. If you're playing, remember to randomise the spaces, of course. You can do that easily right here. 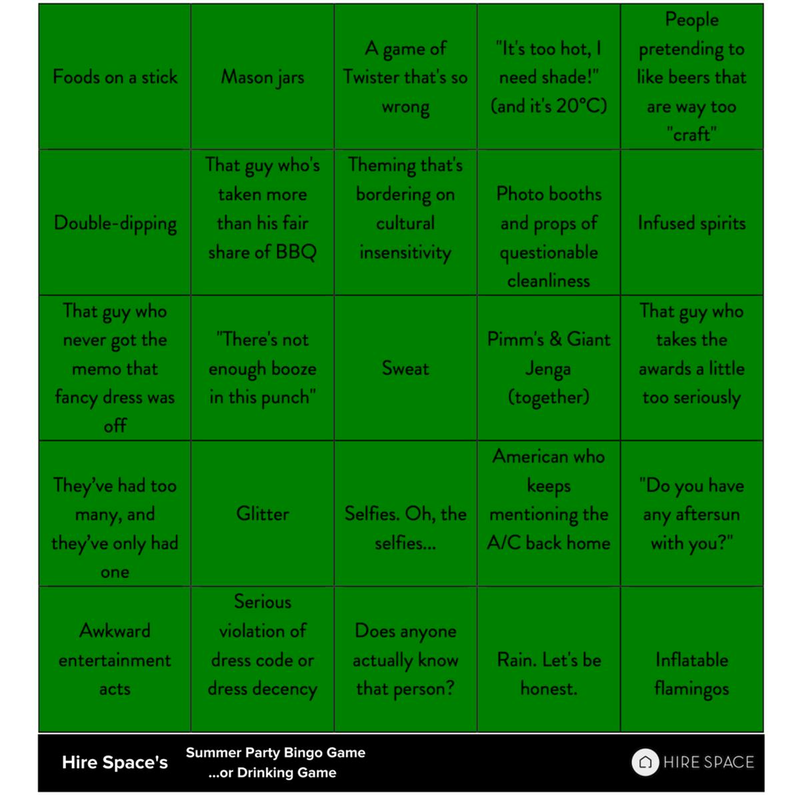 OK fine, let's be honest: we know you're more likely to turn this into a drinking game. So here are the rules to our Summer Party Drinking Game. Drink every time you see/hear one of these. Looking to book your summer party? Check out our eclectic range of summer party venues here – and feel free to get in touch to make an enquiry.